Particle boards - We can supply plain particle board for sizes 1220 x 2440 x 17mm / 18mm. We can also supply 26mm particle board as door filler. Our particle boards are based on bagasse as base. 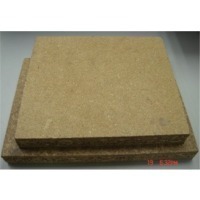 Particle boards - We can supply plain particle board for sizes 1220 x 2440 x 17mm / 18mm. We can also supply 26mm particle board as door filler. Our particle boards are based on bagasse as base. Material : Poplar, pine, hardwood ,etc Grade : E0, E1, E2 1.Quality standard a) density(g/cm3):0.5-0.8 b) percentage of water content(%): 5-13 c) adhesive: U type- same or better urea resin 2.Formaldehyde a) E1: 1.5mg/L below b) E2: 5.0mg/L below 3.Bending strength a) 15.0 type : 15t : E1 - Density: (N/mm): 0.15 above - Modulus of rupture: (N/mm): 0.24 above - Elastic: (N): face: 600 above/ edge: 300 above b) 13.0 type:15t: E2 - Density: (N/mm): 0.13 above - Modulus of rupture: (N/mm): 0.20 above - Elastic: (N): face: 550 above/ edge: 275 above 4.Required material volume to test its performance: 1200 x 1200= 1EA 5. E1: 15.0 type E2 : 13.0 type. Short on time? Let particle-board sellers contact you. particle board Size: 1220x2440mm,1525x2440mm, 1830x2440mm Thickness: 9mm---36mm Material: poplar, hard wood Glue: MR,E2,E1,CARB Density: 700kgs/m3 Moisture: below 8% Production capacity: 1000CBM/ month Category:plain particle board, melamine particle board . Plastic film, carton, pallet. Size: 1220x2440mm, 1525x2440mm, 1830x2440mm Thickness: 9mm---36mm Material: poplar, hard wood Glue: mr, e2, e1, carb Density: 700kgs/m3 Moisture: below 8% Production capacity: 1000cbm/ month Category:plain particle board, melamine particle board. Plastic film, carton, pallet. Size: 1220x2440mm, 1525x2440mm, 1810x2440mm Thickness:4mm5mm,6mm,7mm,8mm,9mm,10mm,12mm,15mm,16mm,18mm, 21mm,25mm,28mm,30 mm,35 mm,40mm Glue: MR glue (E0 / E1 as per preference) HMR green color available. Advantage: heat-resistant, moisture-resistant, and environment-friendly. Particle board Produced by imported machine, it is good quality, density is 670~720, size is 4x8', 5x8'or 6x8' Packed with pallets or loose packed, standard export packed! Shree Satpuda Tapi Parisar Sahakari Sakhar Karkhana Ltd.
Kasner siding is a new kind of the lightweight and high quality building decorative materials. They become worldwide popular so quickly due to the characteristic of its time-saving, low cost, beauty and weatherability. It is not only for external wall decoration of various constructions such as residence complex, superior villas, scenic spots architectures and office buildings, but also suitable for refurbishment of old buildings. Specification: Size: 1220*2440-3660mm 210*2440-3660mm Thickness: 7.5-20mm Other specification is custom-made.